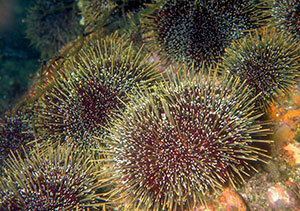 Kina (Evechinus chloroticus) is a sea urchin found in the shallow waters of New Zealand. Feeding sounds associated with Kina sea urchins dominate the evening chorus in the 700-2000 Hz frequency range. Image copyright: Ryan Photographic, http://www.ryanphotographic.com. There are about 700 species of sea urchin. These animals are a type of echinoderm commonly found in kelp beds, rocky shores, and coral reefs. Sea urchins typically range from 6 -12 cm (2.4 – 4.7 in) in diameter, although the largest species of urchin (the red sea urchin, Strongylocentrotus franciscanus) can reach a diameter of more than 18 cm (7.1 in). Urchins have a roughly spherical body covered by a rigid exoskeleton or “test” consisting of numerous calcium carbonate plates. The body is covered by spines, which are long and sharp in some species and are used to protect the animals from predators. Hundreds of small, adhesive tube feet, which are used in locomotion and food transport, also cover the urchin body. The underside of a sea urchin’s body is referred to as the “oral surface”, because it contains the mouth. The mouth of most urchins is comprised of a complex five-part, triangular, calcium-carbonate structure (called Aristotle’s lantern) with large teeth and a fleshy tongue-like sucking part. The hard, triangular teeth are primarily used to scrape algae from the substrate. Although sea urchins are primarily herbivorous (eat plants), they can also feed on sea cucumbers, mussels, worms, sponges, and brittle stars. Sea urchins are important grazers, however, if their population becomes too large, they can completely strip marine environments of plant material. Grazing sea urchins produce underwater sounds that contribute to the surrounding soundscape. The calcified test of the sea urchin acts as a resonator. In the Kina, the scraping of the rocks by the teeth causes the fluid inside the urchin to resonate. This resonance causes sounds to be produced that range in frequency from 800 Hz-28kHz. Scraping of the feeding apparatus and spines also produce sound, but scientists found the sounds associated with resonance to be dominant. Ambient sound levels in coastal waters tend to increase immediately before sunrise and after sunset during the “dawn” and “evening chorus”. The evening urchin chorus is distinctive and may be an important acoustic source of habitat information for other marine organisms listening to this sound (see How to marine animals use sound?). In New Zealand waters, feeding sounds associated with Kina sea urchins dominate the evening chorus in the 700-2000 Hz frequency range. Other sea urchin species could be responsible for evening choruses with a similar frequency bandwidth in other parts of the world. Animal Diversity Web, Echinoidea, (n.d.). University of Michigan,Retrieved from https://animaldiversity.org/accounts/Echinoidea/. Sea Urchin, (n.d.). Wikipedia, Retrieved from http://en.wikipedia.org/wiki/Sea_urchin. Sea Urchin Embryology, Natural History (of sea urchins), (n.d.). Stanford Universit,Retrieved from https://web.stanford.edu/group/Urchin/nathistory.html.